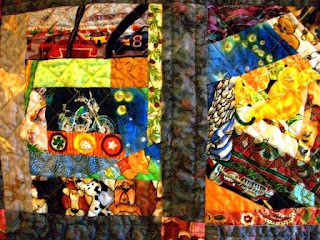 Scrappy Baby Quilt for T.A. I made this one for myself. Ponchos are coming back (or maybe never went away). They were popular when I was younger though I've never had one. I have mixed feelings on the yarn I chose. Part of me wishes I had gone with a neutral solid color, but the colors of this yarn drew me in at the shop.The yarn is Berroco Boboli in color #5340. It took 6 skeins. 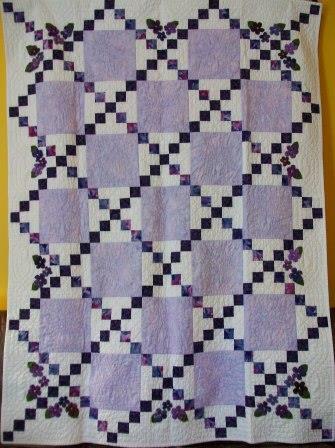 The pattern is Hugo by Gosia Grajdek. Here I am modeling the finished poncho. 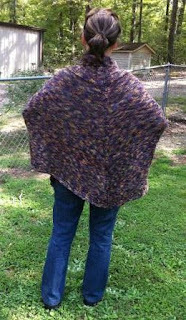 The reason I sort of wish I had used a solid is this yarn doesn’t readily show the detail in the center front/back and along the edge. Here’s a view of the back. 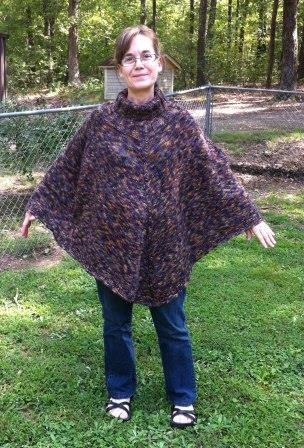 The poncho isn’t asymmetric, it’s just the way I’m wearing it. 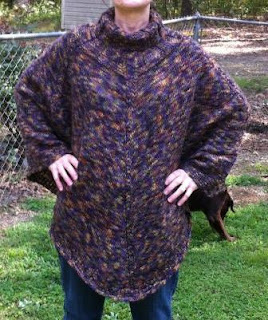 I’m ready for the cooler weather of fall so I can wear it. I made this baby quilt for my niece who is due to have her second child and her first daughter this November. Her son was born two years ago. Here's the quilt I made for him. 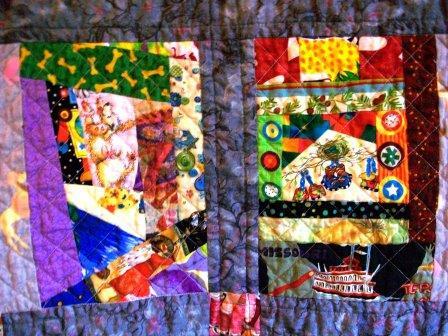 For this one I made 6.5 in X 9 in rectangles sewed together using cotton fabric scraps in a "crazy quilt" fashion. I then sewed strips of gray flannel dog print to each rectangle. 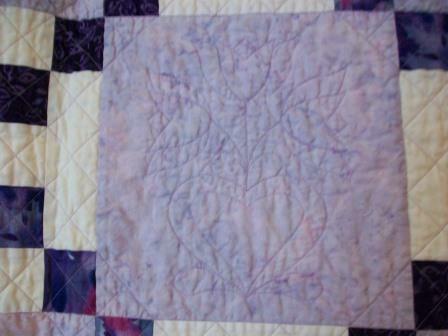 A darker gray cotton was used for the strips with a red print used for the squares on the outer edge. 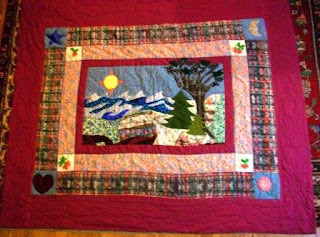 The finished quilt measures 40 in X 45 in. 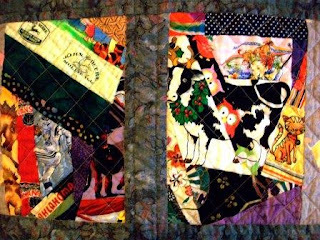 As with my other scrappy baby quilts this one has many items of interest to make up stories or just play “I spy” – dog, bone, feet, angle playing a horn, steamboat. And in these – motorcycle, dog, car, fireflies, cat. In this photo find the cow, the football player, the owl, the girl, the cat. 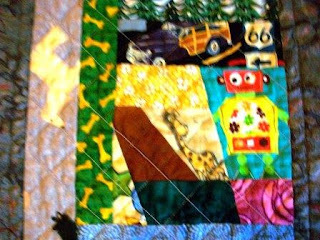 In this one – giraffe, robot, car, dog. The back is an old-fashioned flower print. 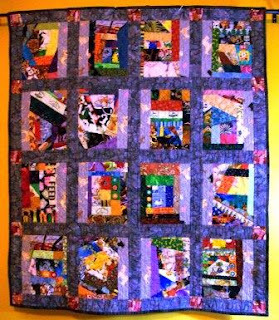 I want to make it clear right up front -- I did not make this quilt. 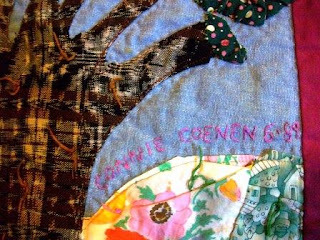 I only had the privilege of sewing on a sleeve so it can be hung up. 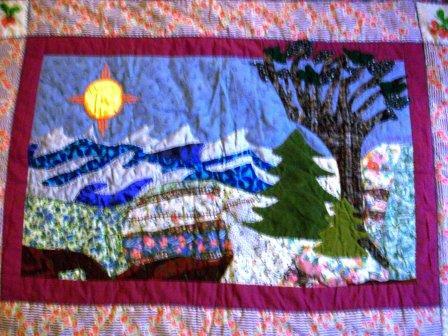 This lovely quilt was made by Connie Coenen in 1989 for H who was born in 1988. She is the daughter of a friend and colleague. This quilt is done using both hand and machine work. It measures 58 in X 68 in. 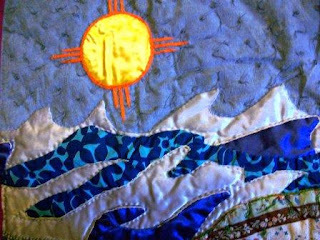 There are many different type of fabrics used giving it a tactile feel in addition to the visual picture. Here is a closer view of the center scene. This photo shows the sun and the ocean waves. These trees are made from a fine wale corduroy. They have a lovely feel to them. 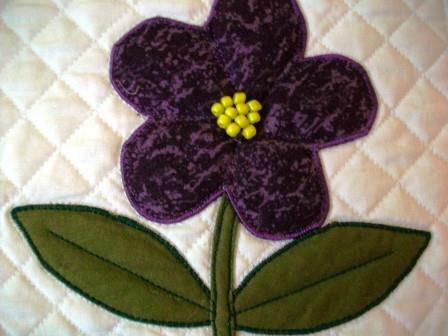 This flower is embroidered. I wish the photo was better so you could really appreciate the work. Rather than sewing on a label, Connie embroidered her name and the date here. 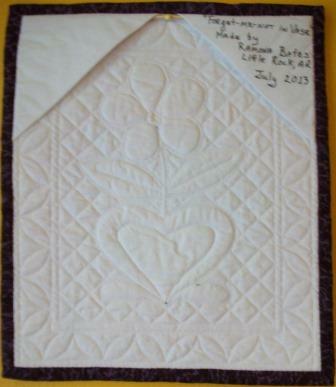 I made my friend @organicgreendoc a small "bonus" quilt for his auction. 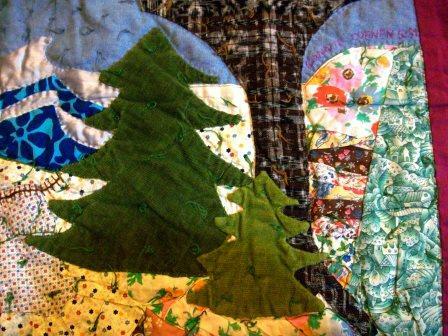 It is machine appliqued and quilted. 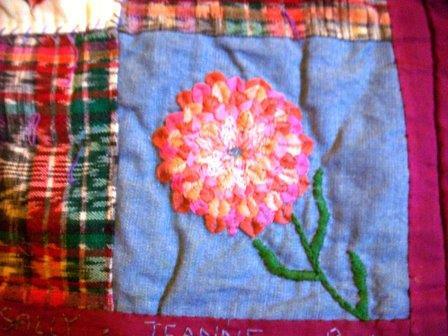 The glass beads are sewn on by hand. It is 10.5 in X 12.4 in. 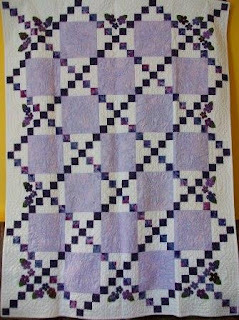 I used the applique forget-me-knot pattern from the book Mountain Mist Quilt Favorites, page 68. 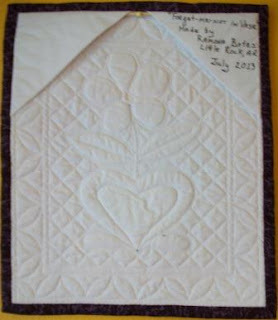 I used my quilt stencil (the one used in the memory lane quilt lavender blocks) for the heart-shaped vase. And here's the back. I used the “quick triangle” method for the “sleeve” to allow hanging. The "Memory Lane" quilt is finished! As you may recall I made it at the request of my friend & medical school classmate @organicgreendoc asked me to make a quilt for a silent auction. He has early Alzheimer’s and blogs about it here. 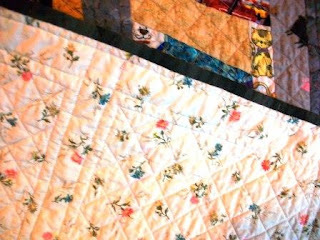 I named the quilt “memory lane” as a play on the quilt pattern I used called country lanes from the book Mountain Mist Quilt Favorites, page 121.I added 3-dimensional leaves and forget=me-knots after I finished the quilting. My first layout meant to represent a path did not work. I ended up placing 42 flowers around the border. It works much better. The finished quilt measures 54 in X 72 in. I added 3-dimensional leaves and forget-me-knots after I finished the quilting. My first layout meant to represent a path did not work. 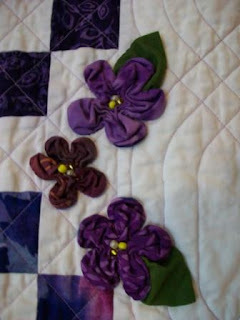 I ended up placing 42 flowers around the border. It works much better. 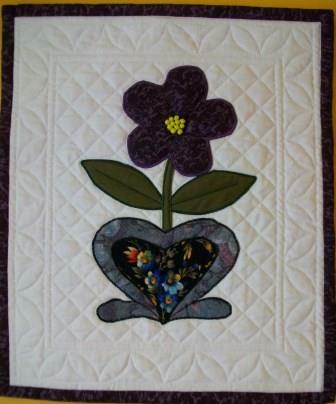 The quilting is difficult to see over the lavender squares, but it's three tulips, leaves, and hearts. Easier to see in the photo in my earlier post. 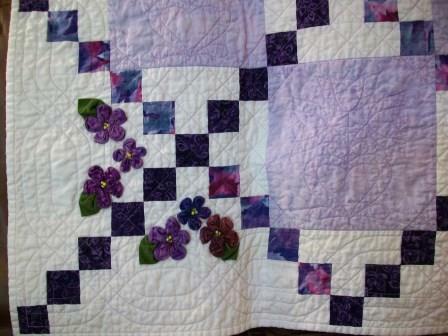 Here are two photos to show the three dimensional forget-me-knots and leaves around the border. 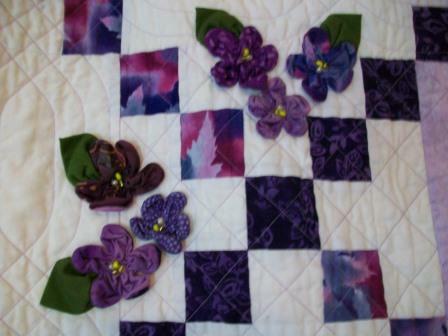 Instructions for making the flowers and leaves can be found here (pdf file, 3/2017--;link no longer active) and a photo of one being made.